The crisis in the Northern Provincial Council (NPC) and by extension, in the Tamil National Alliance (TNA) itself, took centre stage in local politics last week. The crisis was precipitated by Chief Minister C V Wigneswaran’s decision to send several NPC Ministers on compulsory leave pending an investigation into corruption charges against them. It became a full-blown crisis to the extent that all Sinhala newspapers, which usually give only scant coverage to Northern political affairs, had the latest developments in the NPC as the lead story for several days running. Tamil newspapers based in Colombo and Jaffna also had a field day (or two) with the fast-moving story. Indeed, the crisis also gained the attention of almost all Indian newspapers as well, given the Tamil Nadu factor. While the CM’s actions are being cited as the immediate cause of the rift in the TNA, which consists of Illaingai Tamil Arasu Katchchi (ITAK), People’s Liberation Organisation of Tamil Eelam (PLOTE), Tamil Eelam Liberation Organisation (TELO) and Eelam People’s Revolutionary Liberation Front (EPRLF), there was a simmering undercurrent of differences among the camps in the alliance which still support the vestigial aspirations of separatism and those who are committed to the path of political moderation. Some of the CM’s comments with regard to the conflict and present developments had not gone down well with the moderation sections of the party who firmly believe that unity and reconciliation should be the way forward. The NPC ministerial imbroglio led to a much-publicised spat between Wigneswaran and Opposition Leader R Sampanthan, known as a moderate, and also a move to bring in a No-Confidence Motion against the CM by ITAK. 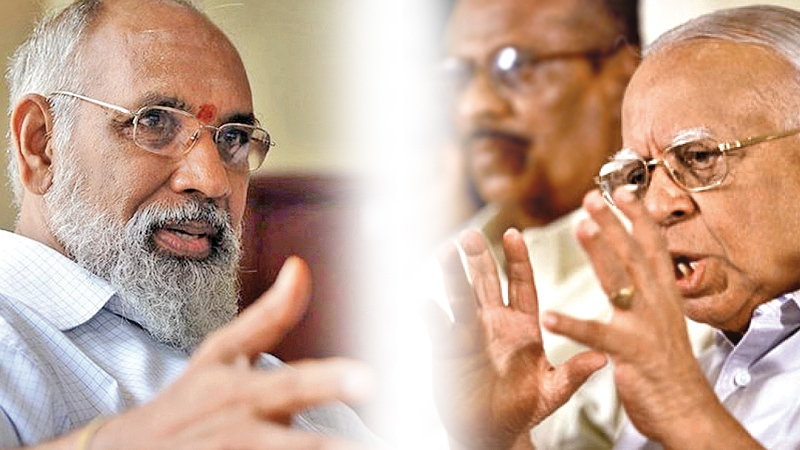 Before the clash came to an end with Wigneswaran softening his stand on the two ministers after backroom moves by religious dignitaries and moderate Tamil politicians, the two Northern politicos were engaged in a war of words. Wigneswaran expressed his willingness to accommodate the two ministers whom he was planning to send on compulsory leave though the charges against them were not substantially proved. Wigneswaran agreed that Balasubramaniam Deniswaran and Dr Pathmanathan Sathiyalingam who were to be subjected to a fresh probe, need not go on leave until the inquiry is complete. “There was no punitive action taken against the two Ministers concerned. They are entitled to draw their salary and use their vehicles etc. It is in order to give protection to the witnesses that it was said that they should take leave while the Inquiring Committee sat,” wrote Wigneswaran to Sampanthan. “There are new charges too against them. I understand your inability to give guarantees with regard to the conduct of the two Ministers. But I am glad you have undertaken to advise them that they should not impede an independent legal inquiry. It is to ensure the independent legal inquiry and to commit the two Ministers that I designed the formula of taking leave for one month,” he added. Wigneswaran has told Sampanthan he was willing to withdraw letters of suspension against the two ministers provided there would not be any political meddling in case there would be another inquiry against them. The TNA leader in a letter informed Wigneswaran that he had already informed the Northern Province Governor that the no-confidence motion would be withdrawn. Now that Wigneswaran has agreed to maintain status quo the ITAK has informed the Governor Reginald Cooray that they were withdrawing the no-confidence motion against him. There were backroom moves when Jaffna Bishop Justin Gnanaparagasam and Chief Hindu priest Sri Somasunderam met with relevant parties to resolve the crisis amicably. PLOTE leader Darmalingam Sitharthdan, EPRLF leader Suresh Premachandran and TELO Selvam Adaikkalanathan also requested both to arrive at a common compromise. It was baffling as to why CM Wigneswaran wanted the two ministers sent on compulsory leave when the inquiry proved otherwise. Ironically, Sampanthan was compelled to give sort of a jurisprudence lesson to Wigneswaran, the retired Supreme Court Judge on the principles of natural justice. Earlier, Wigneswaran had accused unknown conspirators of hatching a coup in Colombo to remove him when he tried to clean up the NPC stables. MP Sumanthiran, an eminent lawyer, was of the view that Wigneswaran should quit altogether. Sumanthiran was critical of Wigneswaran’s political trajectory quite frequently. The Government was watching the situation closely with regard to the developments in the North. The main concern of the Government was that it did not want the Northern leadership to slip from moderate leaders to hardliners. Now that the crisis has been resolved amicably it would no doubt be a sigh of relief for the Government. It will also be a lesson to all other provincial councils. The Bodu Bala Sena (BBS) saga took yet another turn this week with Minister Patali Champika Ranawaka refuting firmly allegations that he and/or Minister Wijeyadasa Rajapakshe were harbouring Ven. Galagoda Aththe Gnanasara Thera of BBS fame. He also took a swipe at several politicians including his former colleague in the Jathika Hela Urumaya (JHU) Udaya Gammanpila in doing so. 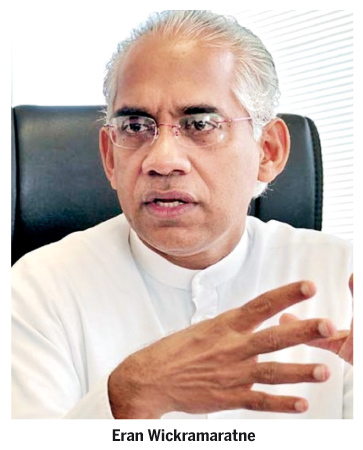 Ranawaka said the Mahinda Rajapaksa faction, which was dreaming of making Gotabhaya Rajapaksa the leader of the country, was slinging mud at the JHU. Mahinda Rajapaksa should know the whereabouts of Gnanasara Thera if he telephoned the counsel who was appearing for the Thera, he said. “It is the same counsel who appeared for Mahinda Rajapaksa, Gotabhaya Rajapaksa and Udaya Gammanpila, who is appearing for Gnanasara Thera. He is the main orator of the “Viyath Maga” programme meant to bring Gotabhaya to power. He may know the whereabouts of the Gnanasara Thera,” Ranawaka said. Gammanpila retorted saying the links between the JHU and the BBS were well known. “I like to tell the minister not to slam the BBS and compel us to reveal what we know. I won’t come into the middle of the dispute between the JHU and the BBS but I warn the minister not to spread misleading statements about the BBS and to push us to the point of publicly revealing what we know,” he said. In the midst of this debate, ministers from both the SLFP and the UNP have flatly denied that any of their Cabinet colleagues could be involved in harbouring Ven. Gnanasara Thera, with Minister S.B. Dissanayake repeating the claim that former Defence Secretary Gotabhaya Rajapaksa had a hand in the BBS. No matter who acts against Muslims, this Government will protect Muslims and punish who harass them, Health Minister Rajitha Senaratne said. Senaratne, who does not have a racist bone in his body and who is known as a passionate advocate of inter-racial harmony, said the national unity built by him at Beruwala was destroyed by some miserable persons. The houses and shops were rebuilt but we could not mend the hearts. I simply do not know how many have become fundamentalists from that incident. We will not allow such incidents to take place in the future’, he said. “We should respect our own religion as well as other religions. Muslims may have problems. But I faced more serious problems because I stood for Muslims,” he said. After being accused of inaction, police last week made several arrests of persons who had allegedly carried out attacks against mosques and Muslim-owned business establishments. Last week, they arrested four people including a Buddhist monk and a serving police officer accused of taking part in an attack on a mosque, as part of a crackdown on violence against the Muslim population. Police said the four were members of the hardline Bodu Bala Sena (BBS) members which Muslim groups have blamed for a string of recent attacks on Muslim-owned businesses and mosques. BBS has denied any involvement in these attacks. Police had arrested eleven people for hate speech offences this month and are monitoring social media sites for any incendiary material. Both the President and the Prime Minister have urged Police to crack down hard on people and groups who engage in physical and online racist and hate speech and attacks against various communities. In a global development, YouTube and Facebook have vowed to stamp out extremist material of all types from their platforms amidst growing concern over the exploitation of the web by extremists. All should realise that stoking the flames of communalism can lead to disastrous consequences. We have experienced several such instances since 1915. Moreover, we should also learn from events overseas. An individual has driven a van into a crowd of Muslims who had attended Ramadan prayers in London, killing one and wounding several others. As these events show, there are individuals and extremists of all faiths and backgrounds who could be inspired by racist or extremist propaganda. Sri Lanka can ill-afford another slide into an ethnic conflict at a stage when moves for reconciliation and lasting peace are underway. The “room issue” between Ministers Kabir Hashim and Lakshman Yapa Abeywardena was also settled last week and Abeywardena settled into the Public Enterprise Development Ministry as the State Minister after the usual formalities. The two men were seen hugging each other and having a good laugh as well after Abeywardena assumed duties at the WTC offices of the Ministry. Both of them had earlier mentioned that it was not a personal issue at all. Significantly, President Maithripala Sirisena and several other ministers also graced the occasion. It took 28 days for the “lack of room” issue to be resolved to the satisfaction of all parties concerned. There was an intense focus on the garbage situation in Colombo with Prime Minister Ranil Wickremesinghe touring several parts of Colombo with Ministers Sagala Ratnayaka, Nimal Siripala de Silva and Ravi Karunanayake to assess the extent of the problem. They witnessed garbage piled up at several places including Pettah. 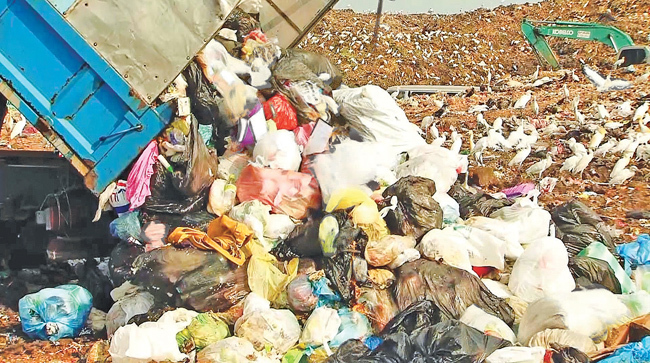 Both President Maithripala Sirisena and Prime Minister Wickremesinghe have urged the relevant bodies to take immediate steps to clear the garbage. A controversy ensued when allegations surfaced that the Government was planning to use the Army for garbage disposal. The Joint Opposition took the Government to task. However, the Government and the Army clarified the true situation - Security forces personnel do not engage in the garbage disposal, Military Spokesman and Army Media Director Roshan Seneviratne said. He said they were only involved in monitoring the unauthorised and haphazard disposal of garbage. “Military personnel will inform relevant authorities about such incidents and monitor the proper collection of garbage,” he said. Regional Development Minister Field Marshal Sarath Fonseka, a former Army Commander, said the Army had machinery and expertise in this field which they would be happy to share with the local authorities. He categorically stated that soldiers would not be involved in the manual collection of garbage. It would be akin to the Navy providing its expertise and boats during the floods for the relief effort, he added. The garbage problem is expected to be sorted out this week. On a related note, the dengue situation could become a huge political issue for the Government if they fail to take timely action. It has been revealed that the Dengue mosquito had mutated its formation and had changed its genetics which had made it rather difficult for the Health authorities to tackle the problem. Hospitals are bulging at the seams with hard-pressed health workers unable to cope with their routine work of monitoring the fluid intake of the Dengue patients which is vital for patient management in the absence of a proper vaccine or any other method of treatment. With over 200 deaths from the new Type II strain alone and 63,000 infected persons this year alone, dengue has reached alarming heights. Out of them, 27,000 are from the Western province, coincidentally the country’s most prosperous province with a growth rate equal to that of China. Both IDH and Sri Jayawardanapura hospitals have stopped taking in any more dengue patients as they are full at the moment. The Government is still looking for a partner for the beleaguered SriLankan Airlines, with the earlier efforts fizzling out. Finance State Minister Eran Wickramaratne revealed that Emirates (the former partner) and several other international airlines have expressed their intentions regarding SriLankan. Emirates had put forward several conditions on catering and ground handling which the Government may not agree with, it was revealed. Meanwhile, a Bloomberg Newswire quoted Emirates as saying that it had no plans to acquire a Sri Lanka airline or airport stake. The Government would be holding talks with all the parties concerned. Emirates which was partnering SriLankan for a long period withdrew from the partnership after the infamous Peter Hill episode whereby Hill, the former Emirate-appointed SriLankan CEO, was asked to pack up by former President Mahinda Rajapaksa. Hill had refused to evict paying passengers from a fully-packed business class to give seats to Rajapaksa and his entourage on a flight from London to Colombo, which incensed the president. Rajapaksa was not on Government business on this occasion and Hill did not accede to his request to bump off ticketed passengers, which would have given the airline a very bad name and a huge loss as well. (Hill was back on board SriLankan briefly as a consultant after this Government came to power, but left to become CEO of Fiji Airways). A discussion was held on Monday between the Sri Lanka Freedom Party and the United National Party ministers on the proposed constitutional reforms. Government ministers met Prime Minister Ranil Wickremesinghe to discuss the proposed constitutional reforms. The committees of the two parties were due to hold separate discussions on the proposals for the Constitutional Amendments. All ministers were later scheduled to meet President Maithripala Sirisena at the Presidential Secretariat to discuss the same issues. We outlined several key issues and components of the Constitution taking shape in this column last week. Several rounds of talks had already been held between the senior ministers of the two main parties on the new Constitution and the continuation of the National Unity Government beyond 2020, although there are ministers and MPs from both sides who want their respective political parties to “go it alone” at the next General Election. There is also a new proposal that ministers, the Prime Minister and the President meet once a month to discuss the challenges faced by the Government and find ways and means to overcome them. This is a timely proposal, because the Cabinet or Parliament may not be the most appropriate forum to discuss certain pressing issues which have to be solved on a more urgent basis.